Use our attorney-drafted Buy-Sell Agreement to stipulate what happens with the shares of a business if unforeseen circumstances arise. 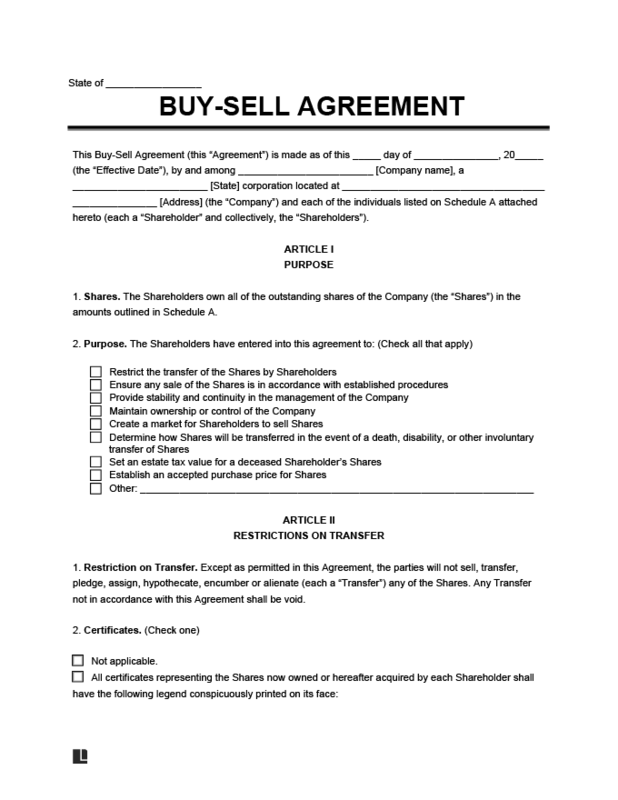 Document the purchase of stocks between a company and buyers. The Basics: What is a Buy-Sell Agreement? Still not what you’re looking for? View all our legal forms here. 2. The Basics: What is a Buy-Sell Agreement? Buy-sell agreements are often likened to prenuptial agreements for companies. A buy-sell agreement is a contract drawn up to protect a business in the event something happens to one of the owners. Also called a buyout, the agreement stipulates what happens with the shares of a business if something unforeseen occurs. This agreement also provides limitations as to how owners can sell or transfer shares of the company. The contract is written to provide better control and management of a company. These agreements are often likened to prenuptial agreements for companies. They stipulate what will happen to the ownership of the business should one of the owners (or the sole proprietor) experience life changes that might influence the continuation of the business itself. Life changes might range from divorce or bankruptcy to death. The buy-sell agreement protects the business and the remaining business owners from ramifications of an owner’s personal life that can impact the company. The sample buy-sell agreement below details an agreement between the shareholders of ‘ABC, Inc.’ regarding the buying and selling of shares of the company. The shareholders agree to the terms under which shares can be transferred and any restrictions there may be when transferring shares. Any company, even a small enterprise, could use a buy-sell agreement. They’re especially important if there’s more than one owner. The agreement would delineate how shares are sold in any situation – if a partner wants to retire, experiences a divorce, or passes away. This agreement would protect the company so that heirs or former spouse’s rights could be accounted for without needing to sell the company. Sole proprietors may need one, as well. If, for example, an owner wanted a loyal employee to take over the company after his/her departure, this could be arranged through this agreement. You can also use one to leave the business to an heir – which is often an excellent way to lower estate taxes that would burden the continuation of the business. Agreements are generally drawn up when a business is initially formed, but they can be drawn up any time. This multifaceted agreement provides clarity to shareholders about a number of important issues concerning their shares. There are a number of ways this agreement can protect a business, regardless of the type of corporation. In the event that a business owner dies, legally his/her shares in the company would pass to the next of kin. As the next of kin control those shares, without an agreement, they might sell off the shares or seek to run the company in a way that wouldn’t be in the best interest of the company, other shareholders, or employees. In the event of a divorce, a court could order that shares in a company be turned over to the ex-spouse. Without an agreement in place, the company may not be able to retain ownership solely in the selected shareholders. If a co-owner wanted to retire or sell his/her shares, this agreement specifies how the shares are valued. Without an agreement, there are often disputes over the proper value of a company and there’s no set agreement to meet the payment arrangements. In a worst case scenario, this situation could result in a dissolution of the company. If owners have a disagreement, without a contract to ensure that the shares of the company are properly sold and valued, one shareholder might sell shares to a competing entity or a party not approved by the remaining shareholders of the company. If you want to find out more, this Forbes article outlines six important things you need to know before creating or entering one. The buyout agreement stipulates what types of events trigger the contract. Each agreement is laid out to best meet the needs of each particular company. It can include specifications about who can buy stocks and the type of life situation that would trigger a buyout. It might also indicate how the purchase will be financed. Life insurance policies are a common way for many businesses to plan for the execution of the buy-sell agreement. In a case of multiple co-owners, for example, the business’ market value of the company would be estimated. Each partner would then be insured by the other owners or the company for his/her portion of the company’s total worth. In the case of an owner’s death or incapacity, the proceeds from the life insurance policy would be used by the remaining partners to purchase the shareholder’s shares with the valuation price going to the deceased owner’s family. This mode of accounting for the total cost of the shares being transferred is also useful in a case where a sole proprietor wants to pass the business on to an employee or an heir. The life insurance policy would carry that named person as a sole beneficiary. Once death triggers the contract, the life insurance money is used to pay the estate, with the company shares transferring to the named beneficiary. 6. What Should be Included in the Agreement? Each business is unique in structure. A business with multiple co-founders would have a more complicated buyout agreement. Whereas a sole proprietorship is often more simple to draft and execute. This list is meant to give you a general overview of clauses and scenarios which should be considered in most buy-sell agreements. Triggering Events. When drafting this agreement, it’s important to clearly define which types of events will trigger a buyout. Death of an Owner / Partner. Without a contract in place, an owner’s share in the company would pass to their heirs. This might not be the ideal scenario for the business or remaining partners. The contract should include a provision stipulating what will be done with the owner’s share of the business at the time of his/her death. This might include transferring the shares to family members for a buyout price. Or it might just allow for the company to repurchase the deceased owner’s shares. Divorce of an Owner. Divorce can pose a particular risk for companies because the dissolution of a marriage is often not amicable. Without a buy-sell agreement in place, it would be possible for the court to grant an ex spouse ownership of shares, which could compromise the running of the business. This segment of the contract would stipulate that shares of a company could be purchased back by the company, rather than being transferred to the ex spouse permanently. Disability or Long Term Illness. In many companies, the business owners represent a good portion of the worth of the company. The work they do has value and will need to be continued in their absence. If an owner suffers a long term illness or has some health event which permanently impairs his/her ability to meet the requirements of his position in the company, you might include a clause to trigger the commencement of the buyout agreement. In this case, the contract will stipulate a clear timeline – how long must the party be unable to work before the buyout is enacted? There may also be clauses which allow for that owner to buy back his/her ownership shares if he/she is able to return at a later date. Personal Bankruptcy. The buyout agreement should also include a clause which allows the company to purchase back shares if an owner experiences serious personal financial issues. In cases of bankruptcy, creditors might go after the owner’s shares in a company. Internal Conflict Between Partners. No matter how successful the venture, partnerships can suffer from personal and professional conflicts. Sometimes these internal struggles are not fixable. With this agreement in place, there’s a set way to sever the partnership which is fair to all parties. Retirement Specifications. It should be assumed that all partners will eventually want to retire. This clause would specify the age of retirement. You might also include whether shares will be retained by the owner or sold back to the company. You may also want to include options for founding owners to stay on in a part time or advisory capacity. Early Buyout. There should be a clause for owners to amicably leave the company if they decide they’d like to pursue other opportunities. This clause would set parameters for the remaining owners to buy back those shares. Payment Structure. The payment structure for a buyout agreement would specifically designate who is entitled to purchase shares in the buyout and how those payments would be made. This clause would include specific information, such as a percentage of shares that each remaining partner is allowed to purchase. There are different possibilities for this structure, depending on the number of partners and size of the corporation. Fair Price Valuation. Your business worth can’t be mapped out in advance because the value will fluctuate over time. For a buyout agreement, the way to determine the value of the business at the time it’s triggered has to be agreed upon. Some companies use a formula to determine the current value of the company. This saves the fees associated with hiring a professional appraiser. The other option is to have a professional business valuation completed. Depending on the type of business, you might also need to stipulate what is being sold in the buy-sell agreement, separating personal from business property where applicable. Financing. A section of the agreement should discuss the acceptable payment methods. Possible options include life insurance policies, loans, installment payments, cash or certified check, and stock options, to name a few. Other arrangements might be stipulated for sale to key employees, such as deferred payment. Right of First Refusal. This section verifies that the remaining shareholders are entitled to repurchase the shares according to the pricing structure stipulated in the buy-sell agreement. No shareholder can sell or transfer shares to an outside entity. A buy-sell agreement offers a concrete way to protect the future of your business and to ensure that it continues past your involvement.